The Buyer: Mr. David Dickens is a senior executive with more than 25 years of experience in the banking and financial services industries. The Seller: JC Grason is an independent income tax and financial services firm, specifically devoted to working with retirees and those planning for their retirement. Their services include retirement planning, tax planning and estate planning. 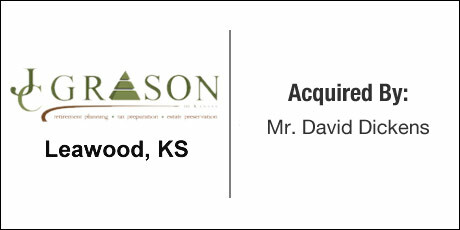 The Close: JC Grason approached the DVS Group with the desire to sell their corporate office in Leawood, Kansas. Prior to taking the business to market, DVS identified Mr. Dickens through their proprietary internal database of passive business buyers. Mr. Dickens’ extensive financial services background made him the perfect candidate to purchase the business. The transaction closed quickly, quietly and with a positive go-forward relationship.